This page is archive 17 of User talk:Jvvg. If you wish to start a new discussion or revive an old one, please do so on the current talk page. 4 Something...coming soon. IF YOU ARE NOT JVVG, DO NOT READ THIS! 6 Ignore this post. It's dealt with now. 7 A question and a head's up. 13 "If you somehow show up where I live and identify yourself as a Wiki contributor, I will bake you cookies"
32 Am I allowed to completely change this? 35 Thank you so much for the resolution. 45 Why does everyone hate me? Quick question. How many colleges have you gotten in to? And just so you know I replied here. I got into all of two colleges. I don't protect archives unless users ask me to, as they may want to change the styling on it or something like that in the future. It's sad that you had to delete my page on Doxing, but no matter. I'm just glad that my information was useful in some way. Thanks! Something...coming soon. IF YOU ARE NOT JVVG, DO NOT READ THIS! no thanks. not at all!!! I know I can do the second and think I can do the first, but doing the third would be difficult since that would require about 1K edits and there's no template I could abuse. However, I could still nominate a few important pages (like the home page, Scratch, etc.) to be deleted. Wonderful! I'm excited for tomorrow! Should we release this now? The Scratch Website has already done something for *you know what*. Could you possible give me the code that you put on the front page? I would like to save it for the April Fools Hall of Fame (which I'm going to be creating) Thank you! Also would you like to judge the April Fools Contest for The Wiki Times? Check out my message on the community portal for more info. You can see the code at User:Jvvg/AF/Scratch Wiki Home. I don't think I want to be a judge, but thanks for the offer. by the way, I forgot to ask you a question before I accepted you into The Wiki Times. Here it is: Which day(s) will you be able to help the Wiki Times? I don't know which days specifically. It's whatever days I'm around. Ignore this post. It's dealt with now. Hey there! He's not going to ban you just because you can find things to edit! Don't worry about finding things at first! Don't feel pressured! Edit page at your own pace. :) Scratch on! We only ban people for bad behavior. Don't worry. Anyway, if you are looking for things to edit, check out Category:Article Stubs or Category:Articles to Expand. A question and a head's up. How do you make your own page in your userspace? This page or section is in question as to whether it is useful or not. You can discuss whether you want it deleted or not on its talk page. 1. Just go to User:IgDegOo/Sandbox (replace sandbox with whatever you want it to be) and create the page. 2. I fixed the logo, but the template looks like it's already been fixed. Thanks for letting me know. Just saying, wikimonitor is annoying!! Hey there! 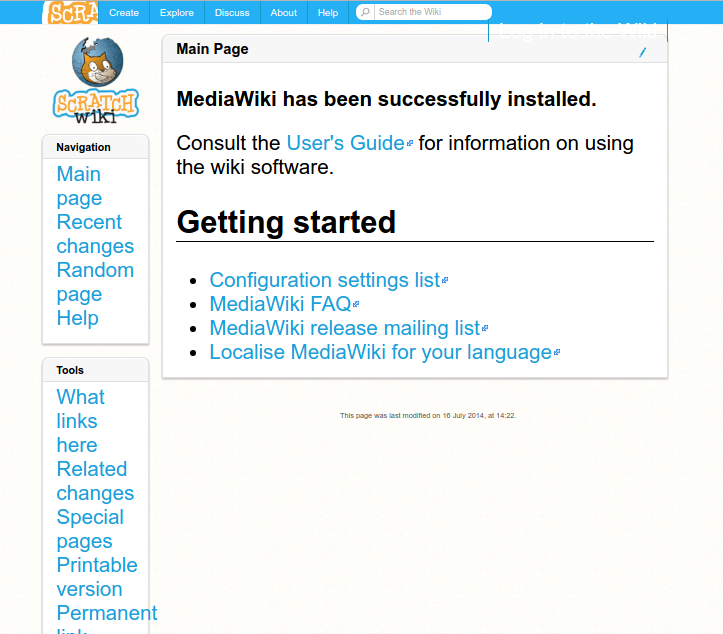 It may be annoying at times, but it is a helpful reminder especially for new users on the Scratch Wiki. And it is not a spambot. It is intended to help other users remember what to do. It's OK, I got it working. Hi there - are you allowed to copy the contents of your userpage, make a page (like User:Banana439monkey/page) and just put the template of it? If you mean make a mainspace page that has the contents of a userpage, we would prefer it if you copied it rather than transcluding, so that the actual contents are all stored in the mainspace. Ah. Anyway. Why aren't the profile pictures showing up? The wiki just looks weird. EDIT: Only the ones in the custom signatures are showing. EDIT 2: It also only works in the vector skin, which I prefer. ┌────────────────────────────────────────────────────────────────────────────────────────────────────┘ I made an announcement on the CP about this. Please read it for more information. Hey jvvg. Could I run WM in my browser, but with a few minor changes? Also, can you delete http://wiki.scratch.mit.edu/wiki/User_talk:Banana439monkey/February_2016/Nominations#Test for me please. I accidentally made it. I deleted your page, but WM isn't really a thing you run in your browser. It's a PHP script you run from the command line. You can find the source code here, but please don't run it on the Wiki, as that could cause some major conflicts. Hey there! Can you add that the next issue (issue 2 1/2) has come out and sign your name? I need to finish it up and then I have to leave, so can you add it whenever you get online? Thank you! You can add it here. The current issue (issue 2 1/2) can be found here. Also, I fixed a glitch on my userpage. It was a button that asked people to make a page instead of commenting on my page. I eventually had to take a picture of it and upload the image. Those are just automatic reminders of good Wiki behavior, they do not relate to bans. Only admins will foretell bans. Yeah, this is just a note informing you that you should try to avoid it, and it's sent automatically. You won't be banned for that. What if someone declines to not use their custom sig after they've been reminded twice? Do they get a ban? People are generally only banned for refusing to cooperate with other users, but usually after receiving several warnings first. If there is an incident occurring, please let me (or any other EW/admin) know so we can deal with it. How did you do that cool little box and the talking mouse? I'm fixing my user page and I'd want to add them! 1. Jvvg makes User:Jvvg/Header and User:Jvvg/Status 2. He uses the noinclude tag. You can use them, but be sure to give him credit. Is it ok if I replace JS's comment on here with [removed]? I think it's an exception to the "don't edit userpages" rule. I'll remove it. Thanks for alerting me. Hiya! Can I use the SW authentication system? If so, is there a link to the source code? If so, can you give it to me? What does the /br tag do? If you mean <br />, that inserts a line break. The difference between that and hitting enter twice is that it isn't treated as a new paragraph. Ah. I've got you now. My banned notice was deleted and I discovered some EW posted a message on my talk page. Whoops, that was my bad. Well, I didn't delete the banned notice, but I did make the post on your page. Sorry jvvg. Hi jvvg, Firstly I am sorry if I did something wrong trying to talk to you (e.g If I am suppose to do this differently). Anyways I was wondering how you the wiki elects its Experienced Wikians and Admins. I am not asking you to make me a EW or an Admin (I am way to experienced with the scratch wiki and its code, etc). That is all though, just wondering how you elect them. But like what requirements are there for an EW and can you apply or something? We hold elections to become EWs whenever we feel it is necessary (generally around once a year, but sometimes a little less frequently). To run in the election, you just have to nominate yourself and meet some fairly basic requirements (last election, it was being 1+ months old and having 50+ mainspace edits). However, if more than 5 or 6 people nominate themselves, the existing EWs and admins will pick who they see to be the best 5 or 6 candidates to run. After that, the community will vote and the top one or two will be chosen. To become an administrator, you already need to be an active EW at the time of an election or occasionally they are appointed for other reasons, but that is fairly rare. Nice start, though it looks like it could use some expansion. Could you protect User_talk:Banana439monkey/Archive_2 please? Can you add the thing where it has text with the mouse on my user page? thanks!! Also you can add credits for jvvg for this. All you need to do is put something like <div title="Hi! This is a message! "> at the top of the page. Hi! Two things: 1. Thanks so much for your kind comments on my application and your approval of my wiki account. 2. Just wondering, how did you become a wiki adminastrator? 1. Please do not blockspam - the plugin's there for a reason 2. You need to firstly be an active EW and they are elected by the community and stuff. To be an EW, you need to nominate yourself when the EW election is here. @EternallyGreen: You need to run in the EW elections to become an "Experienced Wikian" (EW), and each election we appoint one or two active EWs to administrator. (Also, you're welcome :).) @banana439monkey: Please be more respectful of other users and do not remove content from their messages. Not all users are familiar with the rules of the Wiki when they join, and it takes a little while to learn them. Please don't be so harsh when talking to new users (or any users, for that matter). I didn't remove any content. Someone else did. All I did was add a </scratchblocks> tag to the end of the post to stop WM from saying I didn't sign my posts. Aha. I just looked through the history of this page and saw User:Eternallygreen removed it. It wasn't me. I don't want to be harsh, but when you see someone remove something from someone else's message, check the page history to see who edited the message and if the person who made the message made the edit, don't remind them since I'm sure THAT's okay. Never jump to conclusions. My bad. I saw you say not to blockspam and that it was removed, so I figured it was you. I am sorry that I falsely accused you. Anyway, it looks like the situation is resolved now. Don't worry. When I'm falsely accused of removing content, I check the talk page's history and compare two different revisions. I was just notified by WM for the same reason as before. Could you explain this to me? Btw, speaking of bots, should the bot I suggested just run in my userspace? WM has had some issues lately, so I had to restart it. Since you removed the notification, WM looks at the page history, but only looks at the few most recent edits, so occasionally if I have to restart WM people get notified multiple times about the same thing. WM is working properly now, so hopefully this won't happen again. As for your bot, you can clear your own sandbox whenever you want (and that doesn't really need a bot), but clearing other peoples' sandboxes is still a violation of userspace. Ah. I just made an archive, then WM just did that a few days after uploading the image. Oh, wait. I forgot it was the 19th. Yes, I have a bad memory. xD It's probably because I'm busy. Hiya! I know editing someone else's userspace without permission is forbidden, but is it the same with making a page under someone else's userspace? Creating pages under other peoples' userspace is (for all intents and purposes) the same as editing a page under their userspace, so yes it is forbidden. Maybe add "[[User:WikiMonitor|WikiMonitor]], my bot" on the "stuff I've created" section? Yeah, I guess. In a while I'm going to have something very big to add to that list, but for now I'm not publicly releasing what it is. Aw, I can't wait for it! Am I allowed to completely change this? Hello, I have a question. The April Fools page on CS is filled with Kerbal jokes which have absolutely *nothing* to do with CS, and it is basically used as a way to oppose Sonic (which I don't want on the Wiki either). At least the Sonic jokes are somewhat relevant to the subject, but the Kerbal jokes here do not pertain to CS in any way. I have added some jokes about CS. I feel a little miffed that the CS joke page is being used as a pawn in a long-term edit war, because I am interested in the subject. I have brought up the issue on the talk page, with no reponses. Since the jokes are totally offtopic from the subject, may I delete all the Kerbal content and rewrite the page so that it relates to CS? Thank you for your time. Go ahead, but make sure the jokes pertain to CS. If you somehow show up where I live and identify yourself as a Wiki contributor, I will bake you cookies - could I change "an" to "and"? Should separate articles exist for Scratch Blocks, Scratch 3.0 and the Scratch VM, or should they be in one article? Scratch Blocks and Scratch 3.0 look like reasonably different topics (they are both related, but at least from the information I have, they seem different since Scratch Blocks is a libray), so I guess they should be separate articles. Pardon my ignorance, but what is the Scratch VM? In that case, that looks like it should go under Scratch Blocks. Thank you so much for the resolution. I agree with everything that you have said. I have interpreted this as "accepting tolerance, and the diversity and variety of ideas, but trying to monopolize everything with one idea doesn't do anyone favors, and allowing content to be used in such a way that invites humor and fun for everyone, and not just for the people who are editing/posting/whatever". I feel that with this solution, I am satisfied. Embracing multiple ideas keeps one from being too powerful and monopolizing. This was exactly my problem, and you have solved it. Thank you! I also want to talk to PPL and see if we can get a similar kind of agreement on the TBGs, and so that everyone there can be satisfied as well, and avoiding every other post being Sonic. I feel that with this simple idea of embracing diversityand variety of ideas, our conflict has now come to a formal end. Thank you for this. You have just made all of our lives better. Again, thank you! I'm glad that you appreciate what we did (I talked this over with ErnieParke and st19_galla too). I hope that this can be the end of it and am happy to see that you are working with us to keep everything civil. As for the TBGs, those are beyond my control, but I hope you can have a peaceful resolution there too. Thank you. I have tried talking to PPL directly about the resolution and seeing if it can be applied to the TBGs. That would be the easiest thing to do. As such, I hope that she accepts my idea for the TBGs and as such, the entire place won't periodically burst out into flame wars and complaining. Life there has been hard for all users. I'm honored that you gave me exclusive editing privileges of your userpage, but you may want to re-read the comment that you put on your userpage telling other people not to edit it. (Seeing that actually made my day. :) ). I just thought it was funny that you copied the message I had verbatim. Hey there - Not to start a flame war, but st19_galla says you're updating the skin, when I thought I was. Are you actually? I will start working on an updated version once the skin is put on all pages on the main site. Let's work on that once it actually makes it to the rest of the site, as there is a decent chance some stuff will change before then, and there's no guarantee it's going to happen any time soon. Take a look at Category:Article Stubs and Category:Articles to Expand. Hello! Can you please look at the discusion their? Im a little confused about the new rule. My profile also has conversation related to the question. Im sorry, but Im still confused. Is the link allowed, or not? Reading through what I said, my interpretation would be yes. Leaving the link doesn't go against anything I said. Thank you for clarifying. With everything thats been happening thier, I've just started assuming people have been adding/removing sonic content to prove a point. I should have assumed good faith, as you said. Thank you again! Unfortunately, I had to delete that page since it isn't really related to Scratch. st19_galla gave the other SDS curators permission to edit the page - sorry if that wasn't clear! Yes, I am aware of that page, and we aren't hiding it for technological reasons. Second, there isn't any way to restrict what content people are allowed to put on pages, but enough people look at edits that they will see if somebody falsifies a signature. Hey, can I rent out your space? Nobody should "hate" anybody on the Wiki. If anybody is being disrespectful, please let me know and I will deal with the situation appropriately. Looking at your contribs record (at least recent ones), it doesn't look like anybody hates you at all. Most of your edits seem to be accepted, and I don't see any disrespectful behavior towards you (once again, this is just what I see, and I might be missing something). Remember that users on the Wiki are supposed to assume good faith, and this means that in the absence of obvious evidence to the contrary, users should assume that edits were made with good intentions. This means that anybody reverting any edits of yours (or anyone's) probably is not reverting them because they hate you or out of spite, but rather disagreement or thinking that the new content somehow doesn't fit perfectly. However, again, if you do see any instances of disrespect, please let me know and I will deal with them. Hello! Im sorry to say, but for complicated reasons, can you please (a) delete this account or (b)disable/ban this account. Thank you, and sorry that Im leaving. If I do come back, I will ask for my wiki account back. One reason for deleting it is due to some people knowing my password, so I would like it if you could ban this account. BTW I will no longer be on here, so no need to reply. I don't know if I'll be able to change the picture soon because of the cache thing. I'll try to find a chance to do it soon. Is there a type of file that has higher quality that you can upload? It's not an issue with the file type, it's just that it looks like you made the screenshot smaller than it was originally. However, that template also invites anybody else to upload a new version of the picture, so don't worry about it. I did make the screenshot smaller so it wouldn't take up too much space. (I don't know what happens if an image is too big.) If you have a picture of the report screen, you can upload another version. Also, sorry for not replying to your other comment, I don't know how. We don't have any space issues and as long as you don't upload a massive image (i.e. much bigger than a typical computer screen), you shouldn't run into any problems. Also, you reply to a comment by editing the section of the discussion and putting your reply at the bottom of the section, indenting it with one more colon than the previous message (i.e. my first message was indented by one colon, I put your second message with two, and this one has three). See Help:Talk Page for more information. Thanks! Also, is it okay if I make the file smaller a little bit? I need to do that so I can copy the part of the image I want. Would a HTML redirect be allowed instead of using #REDIRECT []? What do you mean "HTML redirect"? Are you referring to using meta tags or a JS redirect? Either way, I'm pretty sure you can't use them. Can you re-review my siggy? This page was last modified on 14 August 2016, at 19:06.